The owners of suburban areas are increasingly undertown and country planning use wide rolls of geotextile fabric. What is the material and for what purpose it is used? Try to understand. The non-woven material made from synthetic polymer fibers interwoven is excellent qualitative characteristics: it does not wear resistant and rot. Thanks to the optimal combination of performance geotextiles is convenient to use in many spheres of human activity: in land management, in construction, landscaping. How can you apply the geotextile on the site? bonded geotextiles - Created by dragging with the help ofserrated needle bonding yarns through the base. It has excellent strength and excellent water permeability, whereby the regeneration is widely used in drainage systems. thermally bonded geotextile - Is produced by the action of heatprocessing fabric in which the synthetic fibers are melted and more tightly bonded to each other. It differs dense structure, high tensile strength, but lower filtration qualities. Environmentally friendly. Geotextile is not subject to degradation on the chemical constituents are not thereby causing harm to human health and the environment. Strength. The nonwoven fabric is resistant to mechanical damage, piercing and tearing stress. Significant elongation of the material to rupture, which occurs due to an infinite length of yarn virtually eliminates its damage during installation. Resistance to the environment. 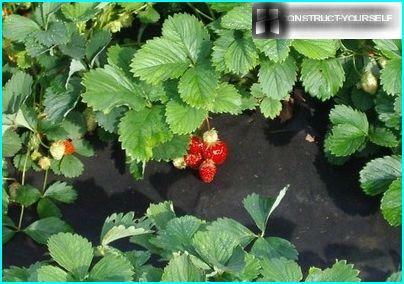 It is not preet, no silts up and does not rot, resistant to UV light, acids, alkalis and organic substances. Easy installation. The material produced in the form of small rolls and light, which is convenient to transport and, if necessary sawn in half the conventional handsaw. The material itself in the application of user-friendly cut with a knife or scissors. Economical in price. With excellent quality characteristics of geotextiles cost is quite low, so they are widely used in industrial construction and for domestic use in the regeneration of suburban areas. 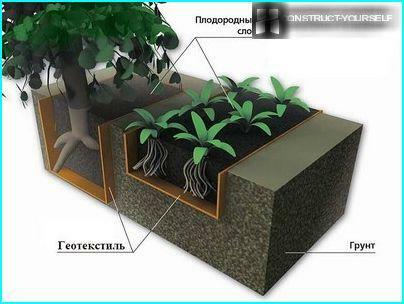 Possible applications of the material striking versatility agrovoloknom. At the same time with the launch of new brands of geotextiles range of use of the material is constantly growing. 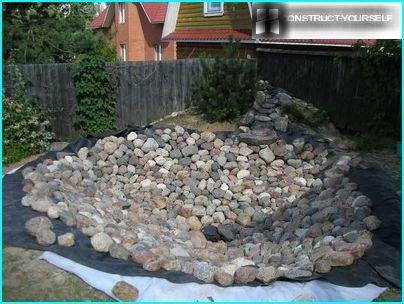 Geotextile allows on-siteany ideas geoplastichnogo transformation of the landscape. Using a non-woven fabric, you can create a new design of the composition, transforming the appearance of the site. It is hard to imagine a land without runawaydeep into the winding garden paths. When planning their arrangement, always want to see the result is a beautiful and functional element of landscape design, which regularly serve more than one season. 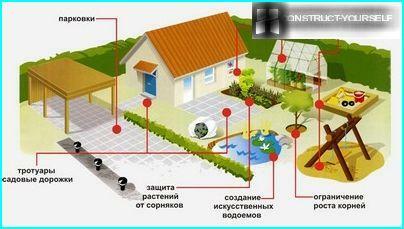 The application allows you to save agrovoloknomdecorative and extend the life garden paths. After all, even a small portion of the device on the track requires a lot of hassle: excavation, backfilling underlying "cushion", laying the coating itself. But during the operation, when the layers of gravel or sand gradually subside in the ground, on the surface of the tracks start to appear hollow, bumps and irregularities. 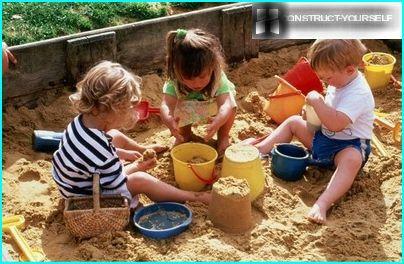 Conveniently use nonwoven andregeneration of sand tracks, gravel areas. Padded between soil and backfill material geotextile optimizes the seal so that the bulk material is practically not penetrate into the soil. This will significantly contribute to reducing the flow of bulk material - and thus the overall economy. In addition, the web would contribute to a rapid outflow of water and prevent the germination of weeds and grasses. In marshy areas and soft ground non-woven fabric and does perform lasting reinforcement function. 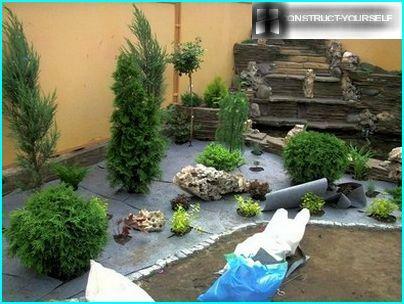 Decorative ponds - popular elementslandscape design. Construction of any of them, whether it's a miniature lake and a large swimming pond requires a special waterproof bowl. During the operation and cleaning of the reservoir is alwaysthere is a possibility of material damage plant roots or the same stones. 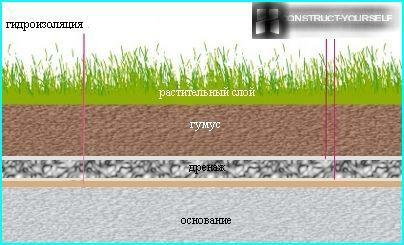 And the use of geotextiles can significantly simplify life. 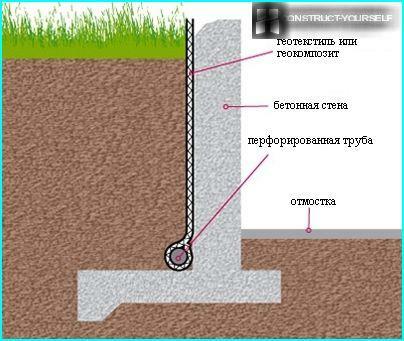 Suffice agrovoloknom lay under a layer of insulation, not to worry more about protecting the material from external damage. Agrovoloknom can be used to create publicsites, registration of rocky gardens. Construction at the site of today's popular patio with wooden terraces and decks also can not do without the use of geotextiles. He lay as foundation soil to eliminate the possibility of sprouting through the boardwalk weeds. With geotextile easily share and build high embankment, strengthening the surface and reinforced soil, drained soil and provide adequate filtering. 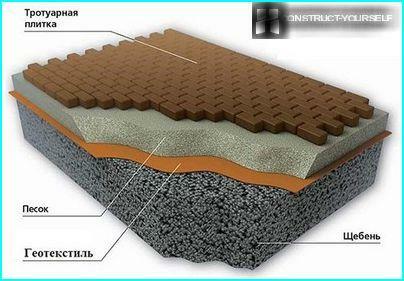 Laid under the turf layer fabric willensure the diversion of rainwater, thus preventing erosion and significantly strengthening the slopes of the uneven surface. Also indispensable geotextiles and equipping playgrounds. The strength and durability of any constructiondirectly depends on the reliability of its foundation. If we talk about the types of concrete foundations, the considerable damage it causes capillary wetting of the ground water. Thermally bonded geotextile helps to improve waterproofing monolithic foundation. Material can simultaneously perform two functions: to separate the layers and provide effective drainage to prevent prolonged contact surface of the concrete base with moisture. Popular Today "green" roofs also can not do without the use of a non-woven material. Yes, and in the regeneration of the inversion roofing material is used to prevent the insulation between the plates prigruzochnogo mother. 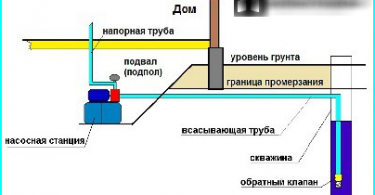 For these purposes, it is placed on top of the insulation layer. Universal material offers incredibleopportunities for gardeners. Applying agrovoloknom can facilitate the cultivation of crops, increase yields, and in parallel with this drive to solve many problems. Weed control - an annual test formany gardeners. Applying agrovoloknom can significantly reduce the volume of work. 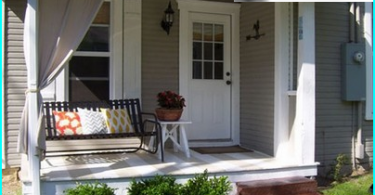 By preventing the growth of weeds, painting in this case will fully ensure the access of water, and with it fertilizers and herbicides, to the roots of garden plants. It is no secret that many ornamental plants"Finicky" in nature. They require special care, preferring the special composition of the soil, which is often different from the prevailing at the ground station. Creating an artificial landscape on depletedsoils require resettlement of topsoil, which under the influence of natural conditions is washed in a thin layer. 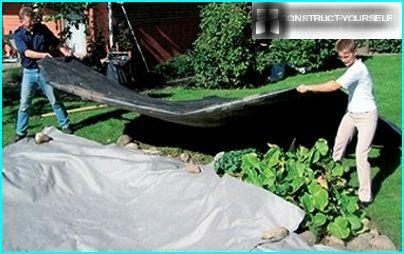 Additional layer of fabric will prevent contamination of infertile soil and leaching. Thanks to a nonwoven web of plant roots will not grow in poor soils. Intra-seasonal night frosts are also a great danger for the plants. Rescued material in the hot summer months, having covered a delicate foliage from the scorching sun. 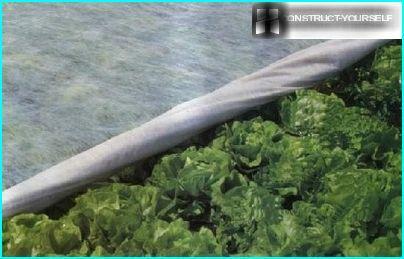 Geotextile - versatile material, the use of which does not require the possession of special skills. 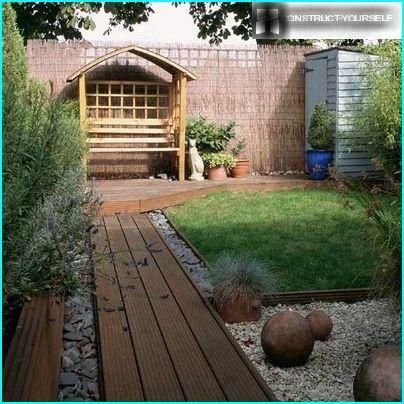 Its use greatly simplifies the work in the garden and for landscaping.